Most printed articles statistics page displays a list of most printed articles arranged in descending order according to the number of times they have been printed by the users. Expand "Statistics" section in left navigation bar and click on "Articles" link. Article statistics page will display; click on "Most Printed " tab to view the most printed articles report. In ML editions, the report displays the articles of the particular language only i.e. language selected in language drop-down. To view the most printed articles in other languages, choose the respective language from the language drop-down available on the right-hand side of the screen. 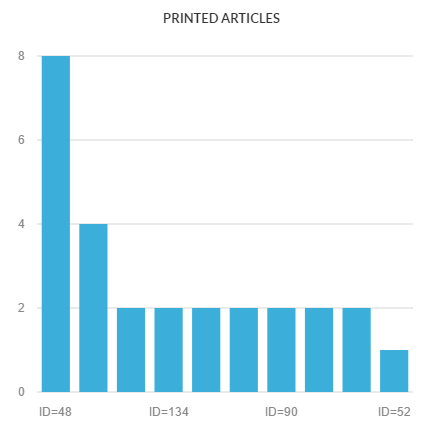 The X-axis of the graph represents the serial ID of the article in the knowledge base. The Y-axis of the graph represents a number of times the article was printed. When you move the mouse pointer on the bar, it will display the ID and the printed count value. # Printed: This column displays the total print count i.e. the number of times article was printed by users.